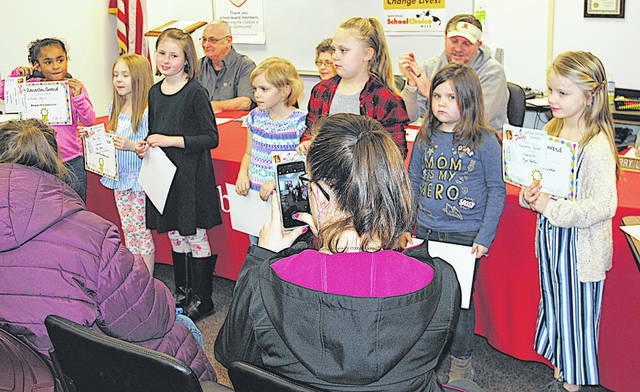 Superintendent Tim Davis, far left, applauds as Hillsboro kindergarten students were honored with character awards for showing respect at Monday’s board of education meeting. Pictured, from left, are Emerie Basford, Justin Pagett, JaZon Young, Levi Carroll, McKenzie Butler and Harper Trainer. Honored but not present for the picture were Sammy Beer, Brandon Maurer, Kingston Captain and Aeralina Montalvo. 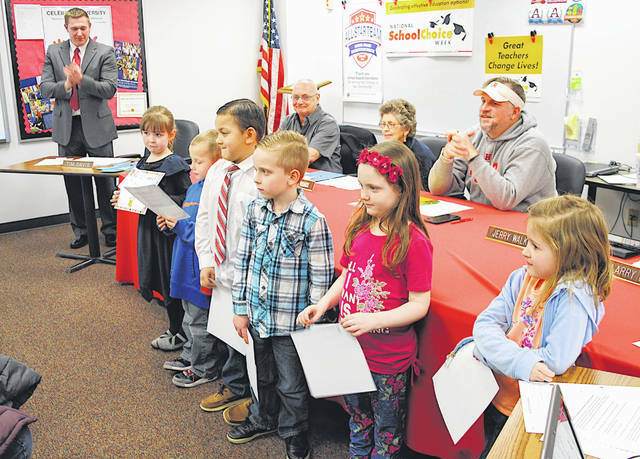 Hillsboro first grade students were honored with character awards for showing respect at Monday’s board of education meeting. Pictured, from left, are Lilliana Harris, Maci King, Emma Penwell, Tatum Whipkey, Embree Lambert, Kallie Stack and Kaydence Butler. Honored but not present for the picture were Serenity Fancher and Adalee Butler. Bids are now expected to go out in late June or early July for the Hillsboro City Schools’ new auditorium, Superintendent Tim Davis said after Monday’s board of education meeting. The board has already hired the design firm Woolpert, which it has worked with in the past, to help plan the 800-seat project with an estimated cost of $6 million. Davis said school officials are still working through the design process with Woolpert. “We have a meeting coming up to solidify the space we have and make sure everything we want will fit,” Davis said. He said the current goal is to start construction sometime in July. School officials have recently visited other schools to look at different styles of auditoriums and determine what they like, according to Davis. When the construction was announced a couple months ago, the school board said it was planning for a 23,000-square-foot auditorium. Original projections were for the project to take about 16 months to complete once construction starts. The auditorium would be an addition to the existing high school with two locker rooms, where students could change and apply makeup for performances. There will not be an orchestra pit like in the old high school auditorium, Davis previously said, but there will be an elevated stage with seating gradually inclining toward the back of the seating area. He said the locker rooms will primarily be for cast members during performances — one designated for males and one for females. Board Member Larry Lyons previously pointed out that the current high school/middle school building was constructed in anticipation of additions. The auditorium will be located on the back side of the building, which was finished with metal sheeting rather than brick like most of the structure. Lyons said it will be located behind the gym, between two exits at the back the building. * Approval of special education students will depend upon teacher limits/space. The board also unanimously approved the following supplemental contracts: Payton Bell, high school assistant softball (split); Michelle Stratton, high school assistant softball (split); Nick Fite, equipment manager; Greg Rhoads, elementary wrestling coordinator. In his superintendent’s report, Davis said the district is hoping to serve even more meals this summer through its summer nutrition program, which was recently honored as Children’s Hunger Alliance Program of the Year. In its first year the program served 16,884 meals over 46 days at eight sites. A year ago, the program operated for 50 days at 12 sites and served 19,553 lunches plus 2,394 breakfasts. Food Service Director Jessica Walker has said she hopes to add another site this summer. Board member Larry Lyons said in his report that he recently met with the district’s Business Advisory Council and several local businesses emphasized the need for drug training and potential employees that are drug free. He said other businesses emphasized talking to legislators about alternate pathways to graduation for students that do not plan to attend college, and about the schools starting career planning programs with students and little earlier in the education process. “Because some of them are taking Post Secondary education and end up taking courses that don’t really benefit them or won’t transfer,” Lyons said. The Hillsboro City Schools Board of Education meets regularly at 7 p.m. the third Monday of each on the former high school campus at 39 Willettsville Pike.